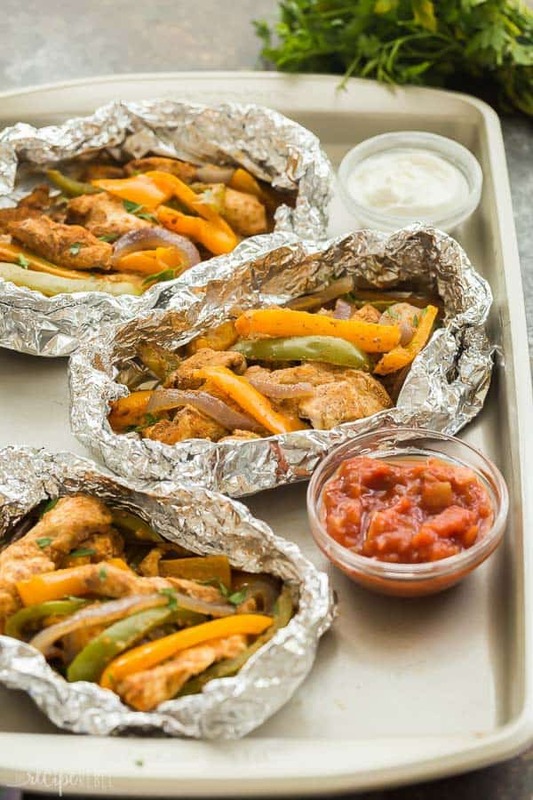 These Chicken Fajita Foil Packets are an easy dinner recipe that’s perfect for summer! 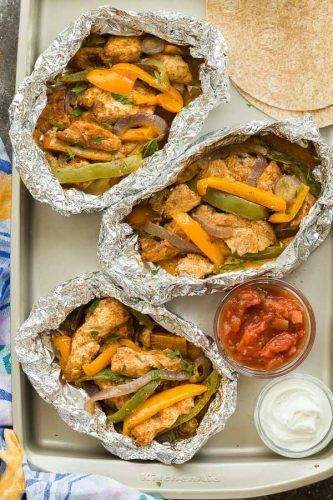 Slices of chicken, peppers and red onions cook together with an easy homemade fajita seasoning, on the grill or in the oven. Serve them with warm tortillas for a no mess meal! Hey everyone! It’s Ashley from The Recipe Rebel back with an easy summer dinner you need to add to your repertoire! I don’t know about you, but we love to take our cooking outside in the summer. It’s fun to come up with new ways to make our favorite dinners on the grill, from Chicken Parmesan to Cheeseburger Pizza! 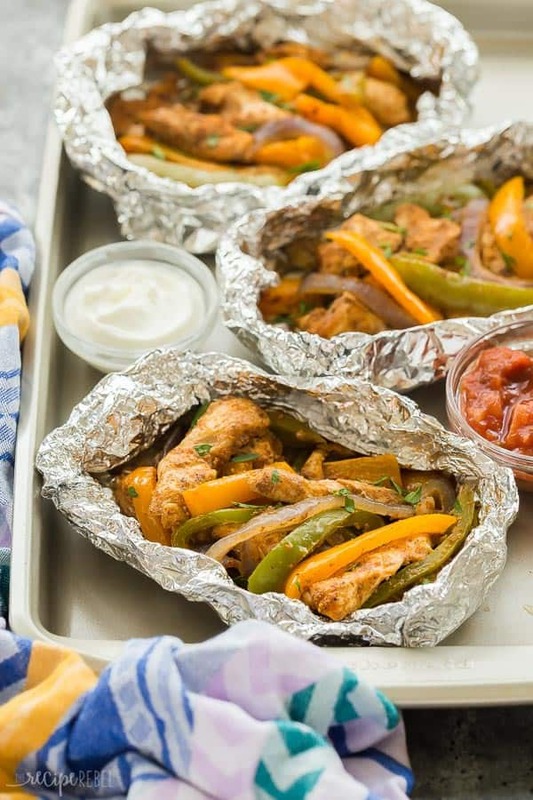 What I love about these Chicken Fajita Foil Packets is that they are so easy to prep ahead. You can slice up the chicken, peppers and onions, and mix them up with the seasoning and then let them sit — in a container or in their foil packets — in the refrigerator for up to 24 hours. Recipes like this are perfect for camping, when you’re not going to want to spend a lot of time on meal prep, and those busy days where you’re running from the park to the beach to the grocery store for a refill on popsicles. You can have them ready and waiting, and when 5:00 hits you can fire up the grill and serve with some warm flour tortillas or rice. Another thing that’s great about these chicken foil packets is that you can adjust the ingredients and the level of spice to suit everyone’s tastes. If a family member is not keen on onions, leave them out. If one likes their fajitas with extra spice, throw in some jalapenos or a dash of sriracha when you’re mixing it up. Vegetarian? Simply leave out the chicken and add in extra veggies like zucchini or mushrooms. Double up on the foil: you really don’t want any of that flavor to drip out (and cause flare ups! ), so double up on the foil to prevent any leaks. Slice your chicken thin: your peppers and onions won’t take long to cook, and your goal is to have everything ready at the same time. Make sure your chicken slices are thin so they will cook quickly as well.